I love great music, and this band out of North Carolina fit the bill. They have been around for over 8 years, but only recently hit my radar. I have a big problem with putting them in a music genre, I guess if you tortured me I would say Prog Rock, but it really is not an apt label. They draw from many influences, The Grateful Dead, King Crimson, The Mothers Of Invention, oh the list goes on and on. A couple of days ago their new CD hit the road running, Genus Thylacinus, and a wonderful adventure it is! It is not often that I praise the US Postal Service, but for once they did indeed come through. 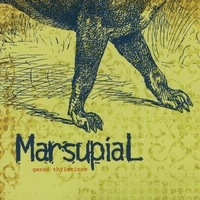 Marsupial had sent me a copy of their new CD and it arrived 5 hours before the interview. There is a postal god! I had heard a few tracks from the album, but I’ll be honest with you, MP3’s just don’t cut it for this long in the tooth reviewer. I like to read the sleeve notes, I like to contemplate the cover art. Much can be learned about a band from these seemingly unimportant items. In this case, the speck of gold dust was that this band recognize the hard work and talent of the sound engineer, in fact he gets the same billing as the band members. I really like that, so few bands recognize the people that actually make the sound the way it does. So kudos to Marsupial for including J Ferris. I lured Marsupial onto my radio show, and it was a great interview. Ian Reardon handles vocals and guitars, Forrest Smith (Guitar and Steel Pedal), and Sound Star J Ferris all agreed to come on the show. They were also gracious enough to permit me to play two tracks from Genus Thylacinus (for those of you that don’t speak Latin and are not anthropologists, it is a small marsupial with a dog shaped face). These are musicians that will go far. They have everything they need, great sound, great writing, and based on my conversations with them, great people. You can catch the whole interview here, and also get to listen to a couple of tracks of this great band. If you like the tracks, and I am sure you will, visit their web site and snag a copy of this CD. Tell em Simon sent you! I love great music, and this band out of North Carolina fit the bill. They have been around for over 8 years, but only recently hit my radar. I have a big problem with putting them in a music genre, I guess if you tortured me I would say Prog Rock, but it really is not an apt label. They draw from many influences, The Grateful Dead, Kink Crimson, The Mothers Of Invention, oh the list goes on and on. These are musicians that will go far. They have everything they need, great sound, great writing, and based on my conversations with them, great people! No user commented in " An Interview with Marsupial About Their New CD Genus Thylacinus "